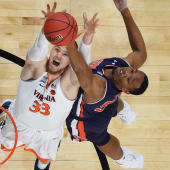 MARTIN, Tenn. (AP) Quintin Dove had 25 points and Derek Hawthorne Jr. added 20 as UT Martin picked up its first Ohio Valley Conference victory, beating SIU-Edwardsville 85-69 on Saturday afternoon to halt a nine-game losing skid. UT Martin (6-13, 1-7) which last won on Dec. 18 when the Skyhawks beat Chattanooga 75-72, dominated the second half to claim the win. The Cougars (6-14, 2-6) were up 40-35 at the break, but the Skyhawks quickly took the lead 44-42 after a Delfincko Bogan trey at the 17:38 mark. Dove hit a jumper and drove for a layup for a 48-44 lead and UT Martin controlled the second half 50-29 to earn its first league win. Bogan had 12 points and Fatodd Lewis chipped in 10 for the Skyhawks. David McFarland had 19 points to lead SIU-Edwardsville which had lost five straight before beating Southeast Missouri State 87-86 in triple overtime Thursday night.